Everyone had such a great time getting to know each other on Day 1 of Inspired, learned invaluable lessons, business tactics, and creative skills on Day 2, and were all ready to knock out Day 3 when it arrived! Thank you once again to miss Callie of Nancy Ray Photography for capturing these beautiful photos! Attendees were welcomed to their seats with a plethora of fabulous goodies from our sponsors. 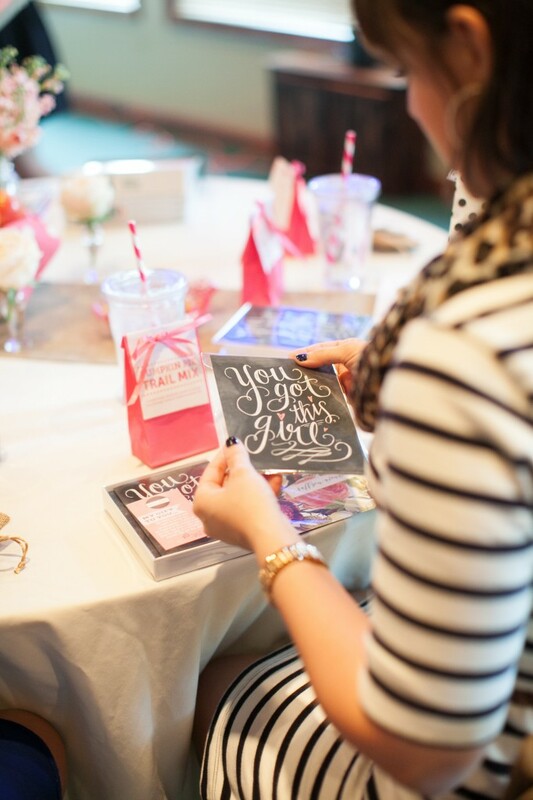 How cute are those chalkboard art greeting cards by Lily & Val, and that Pumpkin Pie Trail Mix provided by Jessica of The Budget Savvy Bride? We also surprised the attendees with little burlap bags filled with Ghiradelli chocolate and a cute little invitation for the dinner we were hosting later that evening. Day 3 was structured very similarly to Day 2 of Inspired, with two keynote speakers opening the day, followed by a variety of breakout sessions. 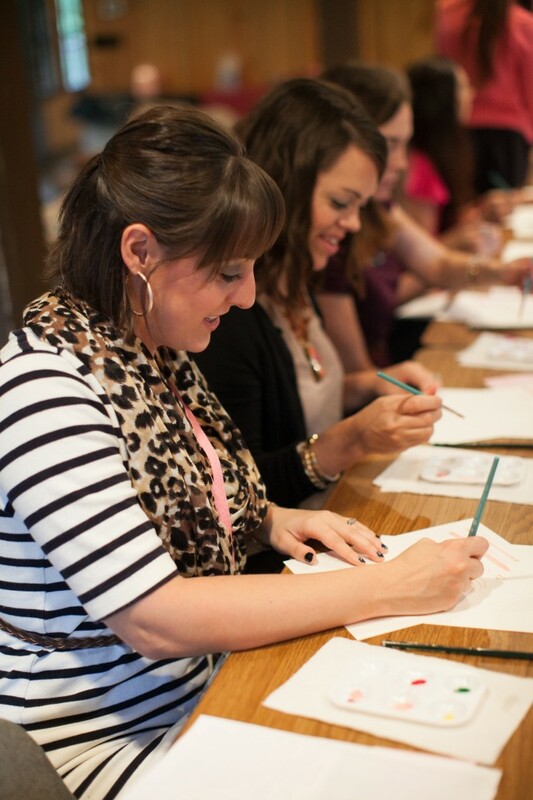 The variety of creative classes were all so interesting, and ones that the attendees could not stop talking about! Sara Rose taught a session on Capturing Life and Family, Val of Lily & Val taught a Chalk Lettering & Illustrating class, and Jessica of Simply Jessica Marie taught a class about Working with Watercolor. 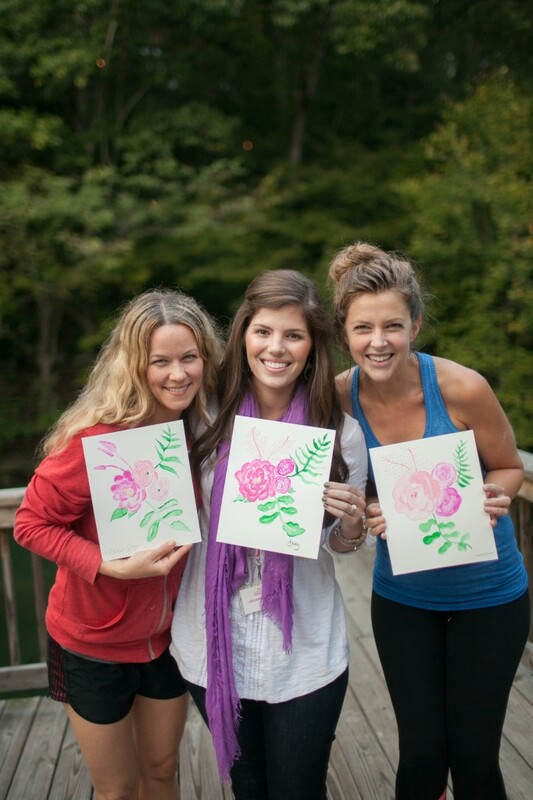 How great did those paintings turn out by some of the attendees! There was also an option to go on a group hike on one of the trails on the property. The view of the waterfall from the trail is stunning! Lucky for us, the weather was wonderful that day and we had the chance to eat our lunches picnic style on vintage quilts outside. After everyone was finished eating, we asked each person to take a moment to think about what they would tell themselves on the first day that they started their business. Each person's quote or saying was different, and we loved looking through them. After all of the lessons were learned for the day, everyone went back to their rooms to get all dolled up, and the Amber Housley team worked our magic to transform the main lodge into a pretty in pink dinner party! Amazing conversations were had during this dinner, as everyone tried to get in every creative thought and question to one another before leaving. That is what we love so much about Inspired. The connections that are made and the relationships that are formed. They are truly invaluable, and so helpful in being a creative entrepreneur. We hope you loved reading these recaps! Don't forget, if you are interested in hearing when we release our 2015 dates, be sure and sign up for our Inspired Insiders email list here.